Are you wondering how to get found online in a world where most of us - especially our customers - start the purchase process at a search engine window? 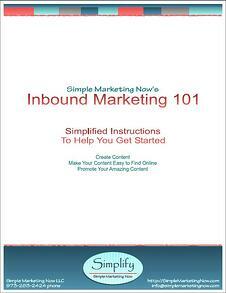 Here's the solution: Simple Marketing Now's Inbound Marketing 101 Guide! Learn how to apply inbound marketing to your business! Simply fill out the form on the right to download our Inbound Marketing 101 Guide and start getting found online!